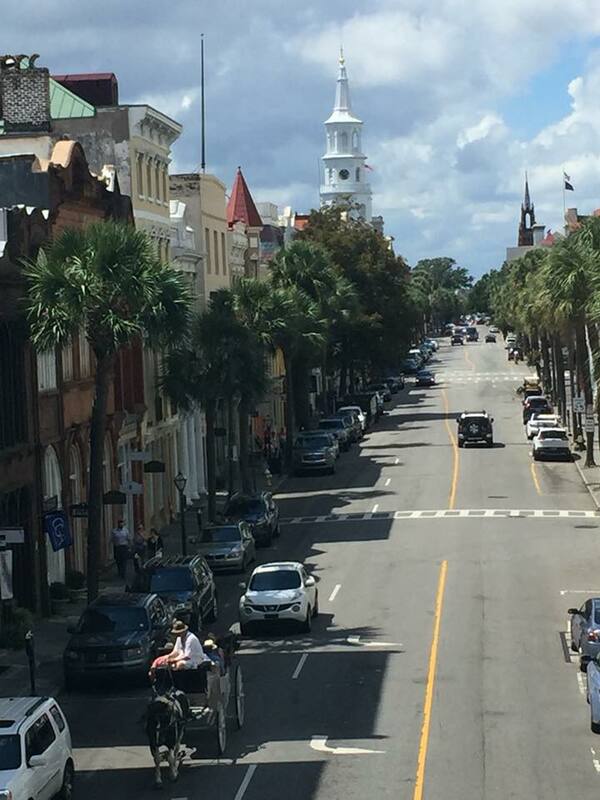 September is a perfect time to travel and leaving the heat of Denver for Charleston, South Carolina was a welcome visit. With ancestors from the area, I was eager to visit this charming city and meet many friends and make new ones. It was everything I hoped for and more. The South Carolina Daughters made certain that I not only toured the city, but connected with my ancestors as well. It was disconcerting to receive an alert on my phone to prepare to evacuate as Hurricane Florence threatened the city, but by then my visit was at an end and I returned to Denver escaping what many Daughters throughout the region had to live through. My prayers are with all that were affected as they recover. Many great conversations were shared about the work South Carolina Daughters are doing. We are proud to be the home of the Tamassee DAR School and look forward to celebrating their 100th Anniversary in 2019. South Carolina Daughters provide continued support both financial and physical to the school and my State Regent’s Project will be to purchase new road signage for the three highway entrances. South Carolina daughters serve in many ways such as Facetiming chapter meetings to shut-in members, conducting pillowcase service projects for deployed service members, creating the “Finding Our Female Patriots” Facebook page as a source to share information on our Revolutionary Era Female Patriots, and revitalizing the state society’s online presence with an overhauled SCSDAR website and Facebook pages dedicated to committees. A casual supper of Lowcountry shrimp and grits was hosted by the Fort Sullivan, Eliza Lucas Pinckney, Rebecca Motte, and Susannah Smith Elliott Chapters on Johns Island. A silver charm and the State’s “Florie’s Hearts” pin were presented as welcoming gifts. 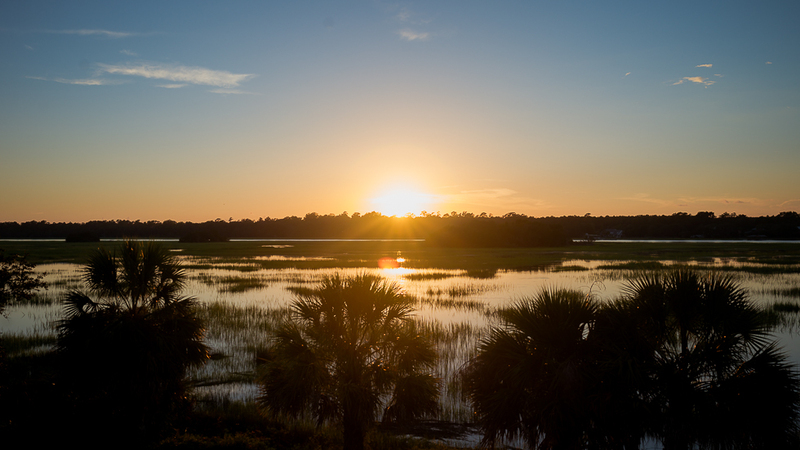 The evening was very relaxing with good conversation and great food, all the while enjoying a beautiful sunset on the marsh overlooking the Intercoastal Waterway. Certified Charleston Tour Guide Susan Lee, provided an enlightening tour of historic downtown Saturday morning on our way to the Charleston Museum. Upon arrival guest speaker Teresa Teixeira, Curator of Historic Textiles at the Charleston Museum, gave a talk on the Colonial Silk Trade. 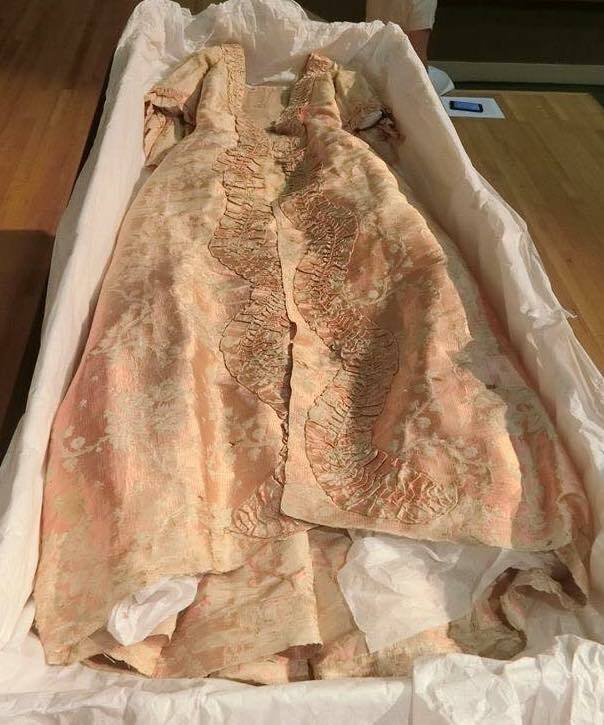 The 18th century silk Robe à la Française gown owned by Eliza Lucas Pinckney was on display for all to see the beautiful restoration work supplied by a Special Project Grant between NSDAR and the Eliza Lucas Pinckney Chapter. As a tribute to Mrs. Dillon, research was performed on her South Carolina patriot Mary Cartwright Withers by Melissa Levesque, Jill Templeton, Ivy Blake, and Tracy Kral. On behalf of the Eliza Lucas Pinkney Chapter, Mrs. Levesque surprised Mrs. Dillon with the documentation including pictures of her ancestor’s restored home. Mrs. Dillon was extremely moved, fighting back tears of emotion. After a delightful lunch visiting with South Carolina Daughters from all over the state, we departed for the Old Exchange Building. 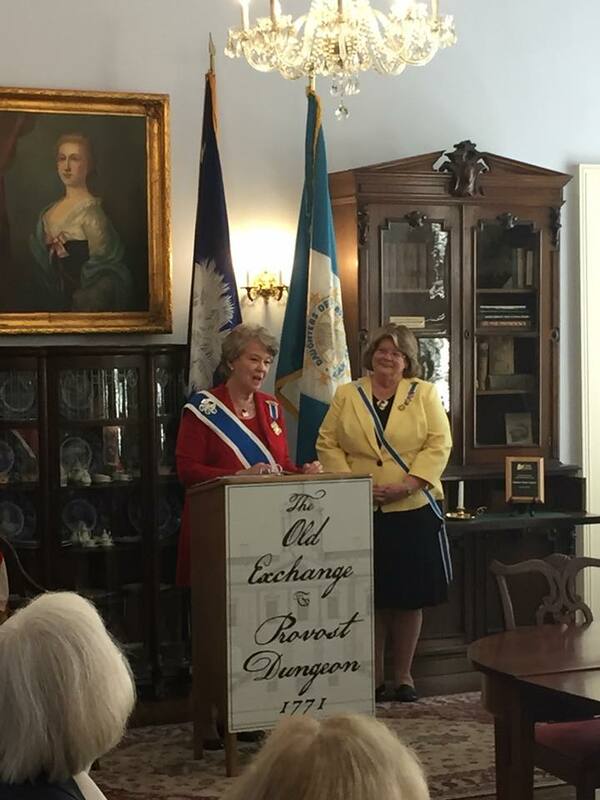 We were welcomed to the Old Exchange Building by Mrs. Pat Kinard, Chapter Regent of the Rebecca Motte Chapter and Mr. Tony Youmans, Director of the Old Exchange Building. Mr. Youmans provided a tour of the building from the Provost Dungeon and Half Moon Battery to the Great Hall in which President Washington was hosted. We ended in the beautiful Rebecca Motte Room where Chapter Curators gave a history of the room’s artifacts. Mrs. Kinard presented Mrs. Dillon with a framed print of the building on behalf of the Rebecca Motte Chapter. I was pleased to present a donation to the Old Exchange Building Commission to be used for further preservation of the historic building on behalf of the South Carolina State Society. The pace changed Saturday evening with a lovely dinner at the Carolina Yacht Club on Charleston’s Historic Battery. Mrs. Dillon moved our audience with her passionate and vibrant speech full of truth and love of God, Home and Country. Entertainment followed with a light-hearted skit on Historic Preservation and a guest appearance of “Patsy Cline” that generated lots of laughs for all. The Tamassee JAC Club sponsors presented a beautiful cross-stitch of the DAR Schools Apple Logo made by the girls of the Florida Cottage to Mrs. Dillon. In appreciation of Mrs. Dillon’s leadership to our National Society and in honor of her South Carolina female patriot, I presented a silver Lowcountry Rice Spoon with the date of her visit engraved in the bowl. Daughters Hearts Unite - Moving Forward in Service to America! #TBT 125 years ago, on April 19, 1894, the Sequoia Chapter in San Francisco, California, planted a �... 20 hours 31 min ago.